Draw the perpendiculars from the AF, BG, CH, DI and EJ on the x-axis. Let X’OX and Y’OY be the coordinate axes. Fix the side of the small squares as one units. In (7, 0), we have the ordinate = 0. In (0, -5), we have the abscissa = 0. In (0,1), we have the abscissa = 0. In (-4,0), we have the ordinate = 0. Points of the type (-, +) lie in the second quadrant. 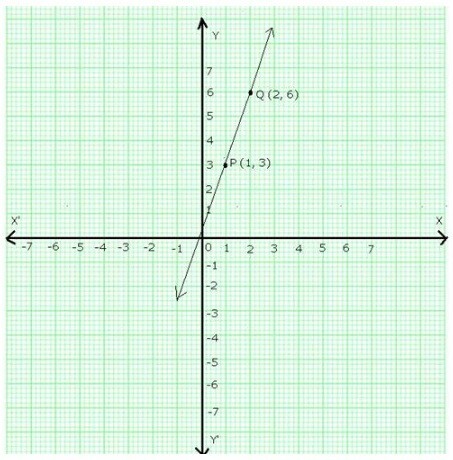 Therefore, the point (-6,5) lies in the II quadrant. Points of the type (-, -) lie in the third quadrant. 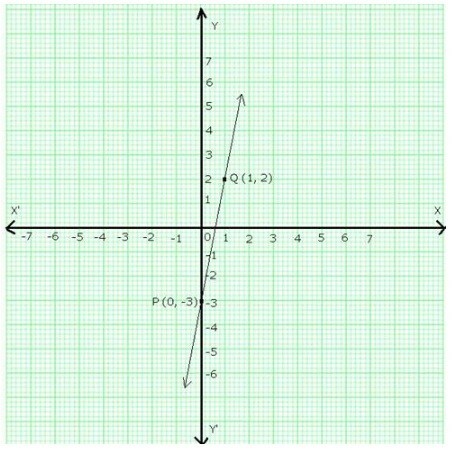 Therefore, the point (-3,-2) lies in the III quadrant. Points of the type (+, -) lie in the fourth quadrant. 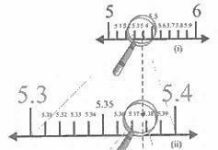 Therefore, the point (2,-9) lies in the IV quadrant. On a graph paper, draw the lines X’OX and YOY’ as the x-axis and y-axis respectively. Then, plot points P (1, 2) and Q (2, 3) on the graph paper. Join PQ and extend it to both sides. Then, line PQ is the graph of the equation y = x + 1. On the graph paper, draw the lines X’OX and YOY’ as the x-axis and y-axis respectively. Now, plot points P(1,5) and Q(2,8) on the graph paper. Join PQ and extend it to both sides. Then, line PQ is the graph of the equation y = 3x + 2. 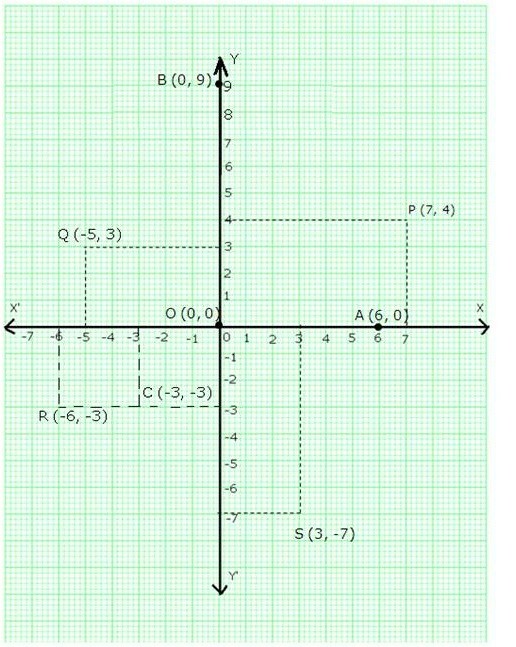 On a graph paper, draw the lines X’OX and YOY’ as the x-axis and y-axis respectively. Now plot the points P(0,-3) and Q(1,2). Join PQ and extend it in both the directions. Then, line PQ is the graph of the equation, y = 5x – 3. 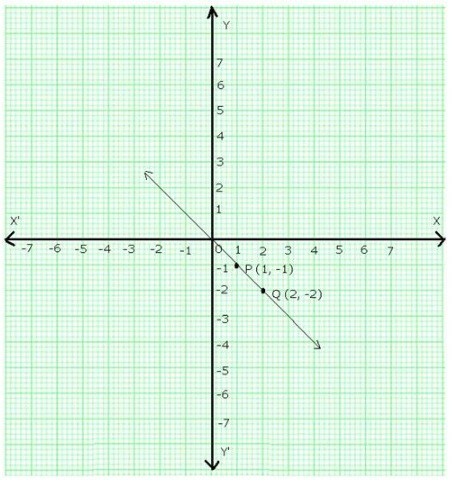 On a graph paper draw the lines X’OX and YOY’ as the x-axis and y-axis respectively. Now, plot points P(1,3) and Q(2,6). Join PQ and extend it in both the directions. Then, line PQ is the graph of the equation y = 3x. 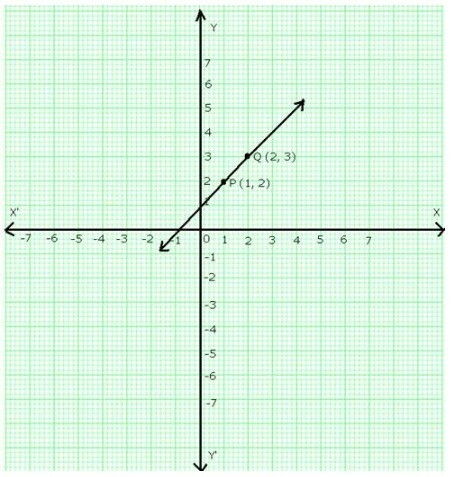 On a graph paper, draw the lines X’OX and YOY’ as the x-axis and y-axis respectively. Now, plot the points P(1,-1) and Q(2,-2). Join PQ and extend it in both the directions. 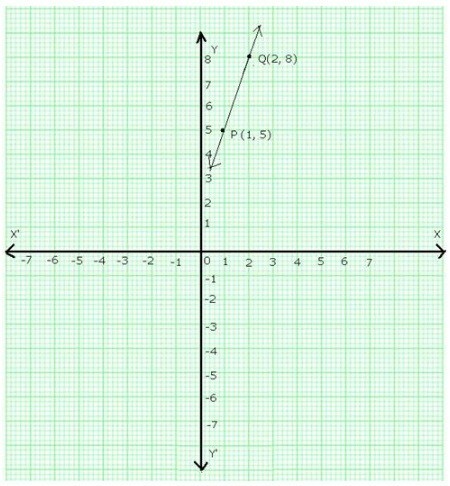 Then, line PQ is the graph of the equation y = -x.